Photo:Our Pastor's daughter's wedding. These two met on a plane and instead of having a regular guest-book they had people dress in travel paraphernalia and put all the pictures in an album. How fun and unique! Denbigh now wants a fedora. I have this habit of saying sassy (the funny kind) things to my husband and running off. That Friday I did that very thing. . .and I caught my toe on the baby bouncer and snap! Toe broke. Eschatology thing went well after that (in my opinion). It's 9:30 p.m. and I pick up my friend Christine to go to Samaj's birthday party. One block away a belt breaks on my car. ( Denbigh was leading worship at T Bar M). There we are stranded on a street corner at night (Yes, I had on 4 inch stilettos). We get a ride home. Denbigh comes home. There's a psychotic 40 pound rabid raccoon in the garage charging at the door! Day Two: Mark McDaid was the one who took my car to his house right by where I broke down and took me home. The next day his wife, Shelly calls us and tells us that he bought the parts and fixed my car (easily a several hundred dollar job). He won't let us pay him. Amazing. Kind. I think to myself that my string of weird attack is over. Next time I think this, I will immediately put on a helmet. Christine and I decided to have a do over night out since we never made it to Samaj's party and we head out to see Becoming Jane at the theatre. I get my happy buttered popcorn and drink and head into the movie. I would love to tell you that a baby cried the whole time or a fight broke out, but this was not my funny experience. I turned the corner on the row we were to sit on . . . and mind you there were no signs it had just been mopped. Can you see where this is going? Oh yeah, I slammed into the concrete floor. Both my feet turned backwards, I hit the entire left side of my body, and my head on the cup holder. By the end of the movie I am throbbing head to toe. Christine is dying laughing. I am wondering why the enemy is trying to kill me...and we go looking for the manager. The pain has gotten ridiculous. It is radiating up my spine all the way to my left eye ball. I told my husband I was going to call and tell Texas Cinemas I would settle out of court for a new Mercedes, 300 movie passes, and a bucket of that popcorn butter. I don't even know if Christine liked the movie? What did you think, Christine? Here's my theory: Keep your eye on what God is doing over here. I am under such attack that I must be about to enter into a profoundly fruitful season! I love God. As I am getting to serve more in a public way, He always tells me to do things to keep me humble...like ask to clean other people's bathrooms or rub their feet. How'd you like to make that call? Um, can I come scrub your toilet?? 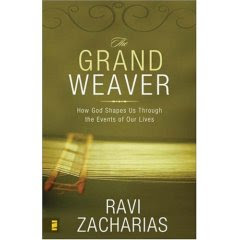 The Grand Weaver by Ravi Zacharias. I do believe this will be a book I will recommend everyone read. The subtitle: "How God Shapes Us Through the Events of Our Lives." ps I didn't even drop one piece of popcorn. "Where the rubber meets the road is the most important point for something, the moment of truth. An athlete can train all day, but the race is where the rubber meets the road and they'll know how good they really are." Another thought: I have heard many a sermon about why we sometimes don't hear from God. It's our sin. We're not listening..etc. Do you ever wonder if God seems silent sometimes so that we can understand the sacrifice of loneliness and desolation Christ faced on the cross for us? Doesn't that silence render you desperately thirsty for God? Just a thought. Maybe in your next period of silence you can praise Christ for enduring the seperation for our salvation. September 14-16 River of Life Church (Austin) Women's retreat. That I would get a clear, full word from God for them. Receptive and humble hearts for them (and me). Anointing as I speak, Angela intercedes, and Janet and Marla lead worship. October 13th - 22ONE7 is showing Beth Moore's Loving Well at the Plum Creek Community Center. We are providing Brunch. Pray for money for advertising and food. Also, pray that women come and receive. I am hoping that we can do this twice a year. God has told us to do something radical. We are supposed to build a retreat center for Ministers and Lay leaders. Pray for us to hear or see exactly where God desires this to be. Also pray for the funds for the project and beyond. I am already praying that the Spirit would bring healing to the site. Lastly, for my husband, to do a live cd. God put it in his heart to record a live cd. We have a friend in London that will distribute it to hundreds of missionaries. Our hope is to record a cd to bless and encourage them as well as reminding the Saints at home to pray for our missionaries. With production and shipping it will cost about $8,000. Some praises: God has given us ample opportunity to lead worship. Fellowship at Plum Creek on Sunday and Wednesday, Metro at Bannockburn on Tuesday night (seeing amazing number of Salvations! ), and we have just been offered a position leading on Sunday nights at Onion Creek Baptist Church. I am speaking again and finishing a second small book (about speaking blessing). God is providing ample opportunity for us to provide retreats for leaders and lay leaders. God is so faithful to us and we praise Him. I am amazed at how He unceasingly brings wonderful things to fruition right before our eyes. We are humbled, thankful, and grateful! Do you ever feel like God is shaking things up (mostly you)? I feel that way. I just ended a seasonal job for the Lord. As soon as it ended, a whirlwind of spiritual activity ensued. I found myself surrounded by prophets the other day and I said, "why don't we pray together? Oh, LORD! Women have been rising up out of the ashes around here ready to serve and excited about the Lord. What was my seasonal task? Two saints that God recently swept from my hand. He just wanted to love them. What happened to me was that I learned to love. He showed me that He was willing to put my entire life on hold to make sure that these two women were sought after and tenderly restored. The reason why I figure is that they have a powerful and exhausting work ahead of them. May the elation of it all thrill you, my sisters. God has a powerful work for your lives. Do not lose sight of that. I miss you both terribly. Emily, as you wonder what is going on in South Africa, remember that nobody puts Baby in a corner. For the better part of a year, God has been teaching me one lesson repeatedly. That lesson is humility. Every book I read has it in there. I feel like the prophet Nathan is leading me around showing me real life stories. I will think to myself, 'Well, isn't that guy arrogant . . ." I quickly hear that I do the very thing they are doing. I have begun to see this theme in many lives and they don't see it. I might see a woman who's boss is extremely critical and she wants to leave. God has put her in that situation to see her own critical spirit. She can't see it. I have found myself quite grateful for eyes to see. I crave this humbling like breath. Our God amazes me. How can something shatter everything you believe about yourself and give you the most confidence you have ever known at the same time? Yesterday, I found myself wide-eyed savoring the pages of Job 38. I started writing a song. I thought I'd put part of my rough draft here. Disclaimer: It's not a completed work. This is just the idea. There is no chorus yet. "I have never commanded the morning. I have never set bounds upon the sea. I have never walked in the recesses of the deep. You alone laid the cornerstone. I have never caused the dawn to know it's place. I have never entered the springs of the sea. I have never divided light or scattered wind. You alone birthed the morning star. You know the way to the dwelling of light. You satisfy the waste and desolate land. You put wisdom in the inner part of man. Denbigh just uploaded some of the footage from the Austin Artist's Showcase at Riverbend Church put on by 102.3 The River. Here is one of the videos. Enjoy. Click here to check out all the videos. Do you notice that Christians more often than not look like Bridezilla instead of the Bride of Christ? That's it. I am just praying repentance for the people of God.